China is out to conquer the world, and many countries have fallen victim to its geopolitical game. Yet there is an emergent corollary; worries about rising global indebtedness to China. As a superpower, China continues to assert itself on the global stage, underpinning a campaign that commenced well over a decade, with its Belt and Road Initiative (BRI) also known as the “Silk Road”. Nigeria, given its prevailing economic challenges, seems hell bent on joining the club of nations indebted to China. The emergent question is twofold: Does the Chinese Silk Road offer Nigeria a panacea? Or does it place Nigeria on the trajectory to a debt peonage? Undergirding the Belt and Road Initiative, is a trillion-dollar loan subvention that seeks to connect countries across continents on a trade trajectory, with China at its core. The ambitious plan involves the building of railway and road infrastructure to connect China with Central and West Asia, the Middle East and Europe (the “Belt”) and creating a 6,000km sea-route connecting China to South East Asia, Oceania and North Africa (the “Road”). The number of countries, mostly African nations already defaulting on their Chinese loans is deeply alarming. In 2017, with more than $1 billion in debt to China, Sri Lanka handed over one of its ports to companies owned by the Chinese government. Now Djibouti, home to the U.S. military’s main base in Africa, seems set to cede control of another key port to a Beijing-linked company. Some analysts have characterized China’s Silk Road and the BRI as “debt-trap diplomacy”. 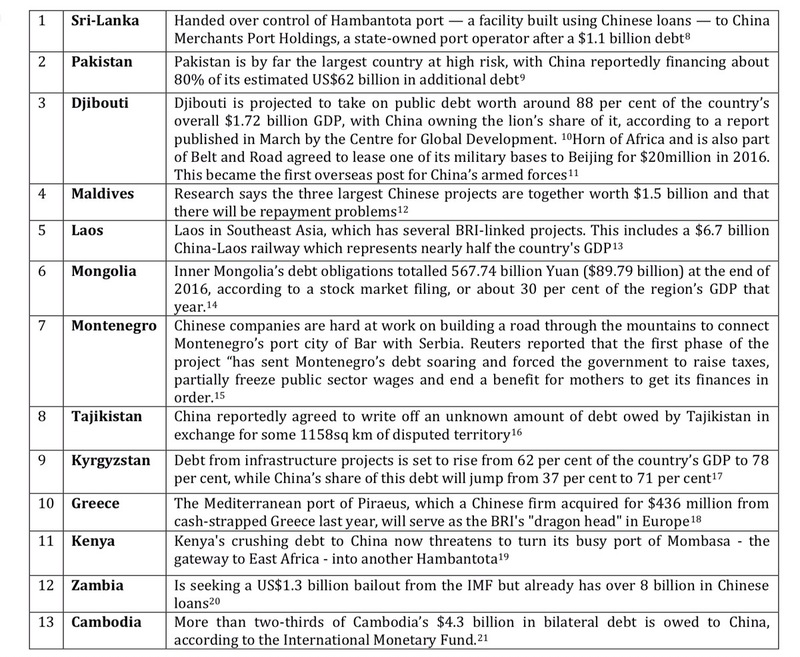 According to the Centre for Global Development (CGD), a non-profit research organization, loans from China by eight nations participating in BRI, namely, Djibouti, Kyrgyzstan, Laos, the Maldives, Mongolia, Montenegro, Pakistan, and Tajikistan, will translate to above-average debt. The China loan-to-debt pitfall is huge and sufficiently wide to gobble up unsuspecting nations. Sri Lanka is a stark example. The island nation was forced to cede a port to Chinese government-owned companies after defaulting on its loans totaling more than US $1 billion. The upshot of the deal signed between two state firms -the Sri Lanka Ports Authority (SLPA) and China Merchants Port Holdings – allows the state-owned Chinese company to lease the port for 99 years. Tajikistan faced a similar fate in 2011. According to the CGD report, China reportedly agreed to write off an unquantified debt owed by Tajikistan in exchange for some 1158sq km of a disputed territory. For its part, Tajik authorities said they only agreed to provide 5.5 per cent of the land that Beijing originally sought. Meanwhile, Kyrgyzstan’s debt from infrastructure projects devolved China is set to rise from 62% to 78% of the country’s GDP, while China’s share of this debt will jump from 37% to 71%. Indicative projections by the Wall Street Journal (WSJ), point to Cambodia and Afghanistan following the same trajectory and possibly owing more than half their external debt to China. The report notes that while in some instances, Chinese debts are forgiven, routinely China responds to such challenges on a case-by-case basis, thus creating uncertainties as to when they will and will forgive debts and under what circumstances they may opt to make territory grabs. Recently, a bipartisan group of 16 U.S. senators urged the Trump administration to block the International Monetary Fund (IMF) from bailing out the countries that have obtained loans from China under its infrastructure development plan. Their joint letter to Secretary of State Michael Pompeo and Treasury Secretary Steve Mnuchin listed Pakistan, Sri Lanka and Djibouti among the countries that have accepted billions of dollars in loans from China, but are unable to repay. Relatedly, it’s noteworthy that Zambia which is seeking a US$1.3 billion bailout from the IMF already has over US$8 billion in Chinese loans. Nigeria-Sino political and economic relations go back to 1971, when the two countries established formal diplomatic relations and exchanged envoys. The period thereafter -1971 to 1998, which coincided with the denouement of Non-aligned movement, witnessed minimal economic activities between the two countries. Indeed there was a near absence of Chinese Foreign Direct Investments (FDI) inflow into Nigeria. Conversely, Western countries dominated Nigeria’s foreign political and economic relations and accounted for most of the FDIs into Nigeria, and nearly all foreign aids, grants and technical assistance received by Nigeria. In return, nearly 90% of Nigeria’s exports (mostly crude oil) went to the West. The tides of events were drastically altered between 2004 and 2006, following the visit of the then-Chinese President Hu Jintao to Nigeria. Not only did President Hu Jintao address a joint session of the National Assembly, he also signed a Memorandum of Understanding (MOU) establishing a strategic partnership with Nigeria. That MOU singularly marked the new phase of Nigeria-Sino relations that consequently led to China becoming Nigeria’s biggest economic partner. Certain economic complementarities are directly responsible for the growing relationship between China and Nigeria. First, is that Nigeria is developmentally challenged given its infrastructure deficits. Second and complementarily, China has developed one of the world’s largest and most competitive construction industries with particular expertise in the civil works, considered critical for infrastructure development. The latter when combined with China’s ability to provide presumably soft loans made its expansive incursion into Nigeria relatively easy. Contextually, China’s engagement with Nigerian was not altruistic. With China’s industrialization drive and massive inflow of FDI, and its attendant expansive manufacturing economy, required accessible and affordable oil and mineral input, which were readily available from Nigeria which is well endowed with these resources. Moreover, Nigeria’s rebased economy made it Africa’s largest economy. Accordingly, whilst China-Africa trade was a paltry $10 billion USD in 2000, by 2014, trade had expanded twenty times to $220 billion. With over $6 billion Chinese investment between 2012and 2017, Nigeria ranks second behind Egypt, as Africa’s largest recipient of Chinese investment. Naturally, Nigeria may well join the swelling club of Chinese debtors (Table below indicates 13 nations heavily indebted to China). There is a surfeit of data showing the scale of China’s investments and influence in Africa. Indeed, the China Africa Research Initiative at the Johns Hopkins University estimates that, from 2000 to 2015, the Chinese government, banks and contractors extended well over $94.4 billion worth of loans to African governments and state-owned enterprises. [Source required] The quantum leap is glaring; rising from a few million dollars in 2000, to over $16 billion in 2013 alone. Whether these loans represent value for money or just inflow of money from the Chinese government to Chinese companies via Africa remains a matter of strident debate. Positive as these loans may seem, they also present a deleterious component, in that often, they abet corruption, as evidenced by the $600 million Chinese loan meant to fund the installation of CCTV cameras across the Nigerian capital, Abuja, but which has since been mired in corruption and scandal. This is hardly an isolated story. Bilateral trade between Nigeria and China has been incremental, rising every year without fail. 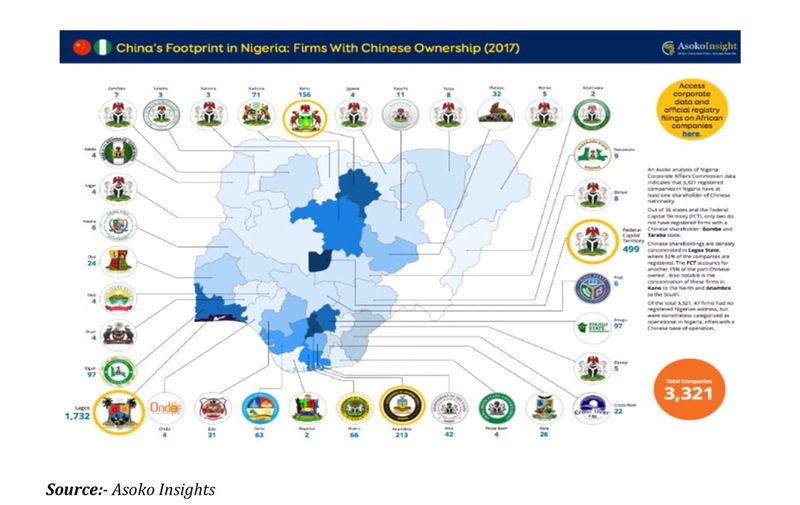 China has a huge footprint in Nigeria. (See table below) Consequently, China remains Nigeria’s biggest trade partner, with available figures from end of 2016, indicating that the volume of bilateral trade between both countries stood approximately at US$14.7 billion. Imports from China accounted for 35% of Nigeria’s total import. Unsurprisingly, there is a trade imbalance since between 2013 and 2015; Nigeria imported 780% more from China than its exports to the Asian nation. The lopsided situation merited being accorded priority in President Muhammadu Buhari’s address at the opening of a Nigeria-China Business/Investment Forum in Beijing in 2016. Similarly, Nigeria and China concluded a currency swap agreement recently, in which 16bn Renminbi (RMB) is to provide adequate local currency liquidity to Nigerian and Chinese businessmen. It’s noteworthy that since 2014, Chinese currency, the Yuan, has assumed greater prominence in world trade with some countries considering it a global reserves currency. The idea to diversify Nigeria’s foreign reserves was first mooted in 2004 by the CBN to increase the percentage of Yuan in Nigeria’s foreign reserves from 2% to about 7%. The initiative stalled until about 2016 when the Governors of the Central Bank of Nigeria (CBN), and the Peoples Bank of China revived the initiative, with a view to assist local businesses by reducing the difficulties usually encountered in search of third currencies. With the deal, Nigeria became the fourth country in Africa (after Ghana, South Africa and Zimbabwe) to sign on to Yuan for its trading and financial market transactions. Nigeria and China signed the agreement in Beijing on Friday, April 27, 2018. Positive as it seems, some concerned Nigerians consider the currency swap unnecessary and worry majority that the country’s foreign trade deals would be skewered toward China, which in turn, may result in economic dependence that might conflict with Nigeria’s sovereignty. Such concerns are hardly misplaced since it could lead to the expanded dumping of Chinese goods into Nigeria, with immense negative consequences given prevailing weak regulations. Grasping China’s impact in Nigeria requires how Chinese firms have been insinuated into and indeed dominates Africa’s economy. China’s huge incursion into Africa has paradoxically been referred to as “China Safari” and “China Bazaar”; terms that connote varying degrees benefits laced with sufficient doubt and disenchantment. To some dealing with China is a gamble, but one which some African states see as a necessary evil, if they must develop their infrastructure. Behind the extensive macro numbers are thousands of uncounted Chinese firms bestriding and operating across Africa. In just eight African countries, the numbers of identifiable Chinese-owned firms range between two to nine times the numbers of firms actually registered by China’s Ministry of Commerce (MOFCOM), which maintains the largest database of Chinese firms in Africa. Extrapolated across the continent, the findings suggest there are more than 10,000 Chinese-owned firms operating in Africa presently. No one can say for sure—not even the Chinese government knows how many Chinese businesses are in Africa, never mind what they are doing there. Prevailing concerns that China’s incursion into Nigeria might have negative consequences in the long-term cannot be over exaggerated. China-Nigeria investment relations just like any bilateral relationship, has some advantages and disadvantages. Thus, whether the Chinese Silk Road represent Eureka or a; debt peonage for Nigeria can only be determined in the near future. The pointer, for now is on the balance and the pendulum could swing either way. Meanwhile, Chinese economic interests in Nigeria can be broadly classified into two parts: private and public. As information from the Nigerian Investment Promotion Commission (NIPC) reveals, Chinese private FDI are mostly in agro-allied industry, manufacturing and communications sectors. Correspondence is observed between countries with large Chinese natural resource investments and those with large Chinese infrastructure financing for power and transport. This nexus is explained by the compelling need to link mining deposits with power required for processing and rail and port infrastructure required for export. Nigeria, though a major recipient of Chinese infrastructure finance, received relatively small volumes of Chinese infrastructure finance during 2002 and 2005. However, in 2006 there was a major surge when China made almost US$5 billion of infrastructure finance commitments to Nigeria, an amount that accounted for some 70% of China’s total commitments to Sub-Saharan Africa for that year. Comparatively, sectoral spread of Chinese infrastructure finance in Nigeria varies little from those on the entire Africa, with transport infrastructure projects amounting to 65.0% of all commitments followed by power with 24.0%. Chinese investment is concentrated in a few sectors that are of strategic interest to China, especially in the extractive industries. They are carried out largely by state-owned enterprises or joint ventures. An optimal outcome from Nigeria-China relationship will depend on the policies and institutions that are put in place particularly by Nigeria to maximize the complementary effects and to minimize the competing and deleterious effects. China is virtually everywhere in Nigeria, but information about its engagement and activities remain opaque and fragmented. There is therefore, need to establish a coordinating body on China. This body, preferably a technical arm of an existing body, should be empowered to scrutinize and evaluate agreements, memoranda and any other articles of association between Nigeria and China. The ultimate objective of the proposed body is to spell out the cost as well as the benefits of Chinese-proposed projects and/or programmes. This is similar to what a legal department would do to an agreement before initialising/signing. The proposed technical committee in its assignment must have taken into consideration domestically available resources including skills and ensure that as much as possible, the local content of the agreement is high enough not only for the purpose of generating employment for Nigerians, but also to develop their technological capability. Nigeria-Sino economic engagement represents a Catch-22 situation. Perceived short and long-term benefits notwithstanding, Nigerian Government needs to urgently institute policies aimed at maximizing the direct and indirect benefits as well as in minimizing the possible negative impacts. A litmus test for gauging the motive of FDI is to classify investments into tri-niche strata: resource-seeking, market-seeking or efficiency-seeking. Efficiency-seeking FDI is preferred to other forms, at least from the perspective of the host country. Furthermore, there is need to ensure implementation of laws and regulations in Nigeria and to ensure compliance by the Chinese investors. Such laws include labour law, corporate social responsibility laws and local content requirement. The Nigeria Labour Congress and its counterpart in the private sector should ensure full compliance with Nigerian labour laws by Chinese-owned firms. Finally, Nigeria must continue to evaluate its cumulative indebtedness to China, and its ability to amortize such debts without defaulting and without being debt-strapped unwittingly.